Background: Extended-spectrum beta-lactamase (ESBL)-producing strains are causing an increasing problem worldwide. Infection control is most effective when ESBL strains are detected by rapid, sensitive, and specific tests and an early implementation of appropriate antibiotic therapy is initiated. Recently, a rapid and cost-effective biochemical test for the detection of ESBL, the ESBL Nordmann/Dortet/Poirel (NDP) test, has been implemented. Aims: The aim of the study was to detect ESBL by a rapid NDP test. Settings and Design: The prospective study was conducted in the Department of Microbiology at a tertiary care hospital. Materials and Methods: A total of 208 isolates were subjected to the ESBL NDP test. Simultaneously, these isolates were also tested for ESBL production by double-disc synergy test (DDST) method. The ESBL NDP test was also used directly with spiked blood cultures inoculated with ESBL producers and non-ESBL producers. Statistical Analysis Used: Descriptive statistics such as mean and ratio are used for the interpretation of the study. Results: Using the ESBL NDP test, 80 of 208 (40%) of the tested isolates produced ESBL, among which Escherichia coli were 56 (70%) and Klebsiella pneumonia were 24 (30%) which showed positive result. Our results, done directly on clinical isolates as well as on spiked blood cultures inoculated with them, showed a perfect correlation between the ESBL NDP test and DDST in detecting ESBLs. Conclusion: This inexpensive ESBL NDP test might be implemented worldwide, especially in resource-limited settings of developing countries to optimize rapid choices of antibiotics for treating severe infections and avoidance of overuse of carbapenems. Antibiotic resistance in Gram-negative rods is an increasing problem worldwide. Since the introduction of broad-spectrum cephalosporins into clinical practice, the selective pressure of the use and overuse of antibiotics has resulted in the emergence and rapid development of resistance to extended-spectrum beta-lactam antibiotics. Numerous outbreaks of infection with organisms producing extended-spectrum beta-lactamases (ESBLs) have been observed throughout the world, and these organisms causing nosocomial infections that lead to prolonged hospital stay, increased morbidity and mortality, and consequently increased healthcare-associated costs. Treatment of infections caused by ESBL-producing organisms with extended-spectrum cephalosporins or aztreonam may result in treatment failure even when the causative organisms appear to be susceptible to these antimicrobial agents by routine susceptibility testing., In addition, patients colonized or infected with ESBL-producing organisms should be placed under precautions to avoid intrahospital transmission. Not only this, the absence of new, effective anti-Gram-negative bacterial antibiotics also makes infection control the most important countermeasure against multidrug-resistant Gram-negative pathogens. Infection control measure can prevent additional infections and the spread of resistant pathogens. Infection control, particularly for sepsis, is most effective when ESBL strains are detected by rapid, sensitive, and specific tests and an early implementation of appropriate antibiotic therapy is initiated. The most frequently encountered ESBLs are CTX-M, SHV, and TEM families., CTX-M-type ESBLs are on rise, and they share only 40% homology with TEM and SHV enzymes. The need for ESBL detection is utmost importance so that it is possible to set breakpoints for injectable cephalosporins and aztreonam. There are various methods for detection of ESBL. According to the Clinical Laboratory Standards Institute (CLSI) recommendations, screening for ESBL production can be done by employing cefpodoxime, ceftazidime, aztreonam, cefotaxime, or ceftriaxone followed by the inhibition of the ESBL activity in the presence of a beta-lactamase inhibitor, mostly by clavulanic acid or tazobactam. Sensitivities and specificities of the double disk synergy test (DDST) and of the E-test proposed for that purpose are good, ranging from 80% to 95%. The automated methods used in the detection of ESBL-producing organisms had a much higher sensitivity (80%–99%) than specificity (50%–80%). However, those tests consume 24–48 h before ESBL production is detected, with a subsequent delay in the initiation of appropriate antibiotic therapy. Molecular detection by real-time polymerase chain reaction (PCR) and DNA microarray assays to detect ESBL gene variants have become commercially available. These PCR-based techniques require isolation of bacteria from clinical samples before susceptibility testing and phenotypic identification, so they are time-consuming as well as costly and require employment of trained personnel. In addition, for the TEM and SHV type enzymes, detailed gene sequence analysis is required for differentiating narrow spectrum beta-lactamase from ESBLs. Recently, a rapid (turnaround time of 30 min) and cost-effective biochemical test for the detection of ESBL is the ESBL Nordmann/Dortet/Poirel (NDP) test has been described. This test, which has a high predictive value, is based on a technique designed to identify the hydrolysis of the beta-lactam ring of a cephalosporin (cefotaxime), which generates a carboxyl group, consequently acidifying the medium. It can either be performed in a 96-well microtiter plate or into a single tube or into aliquot. The acidity resulting from this hydrolysis is identified by the color change using a pH indicator. Inhibition of ESBL activity is evidenced by adding tazobactam in a complementary well. The ESBL NDP test may be performed on isolated colonies or directly from clinical samples. Rapid detection of ESBL producers can be done directly from spiked blood cultures. A total number of samples studied were 208. The study duration was from March 2015 to June 2015 (3 months). All the successive and nonduplicate Enterobacteriaceae clinical isolates were included in the study. Nonfermenters and Gram-positive isolates were excluded from the study. The tested clinical isolates were mixed in 150 μl of 20 mM Tris-HCl lysis buffer in tubes. Mechanical lysis of bacteria was performed by strong agitation of tubes using a vortex for 30 min at room temperature. Bacterial suspension was centrifuged at 10,000 rpm at room temperature for 5 min. A 30 μl volume of the supernatant was mixed in an aliquot with 100 μl of a 1 ml solution made of 3 mg of purified cefotaxime sodium salt in a pH 7.8 phenol red solution. The phenol red solution was made by taking 2 ml of a concentrated pH 8 phenol solution (made from a mixture of 0.5% phenol red in distilled water) to which 16.6 ml of distilled water was added. The pH value was then adjusted to 7.8 value by adding drops of 1 N NaOH solution. A mixture of the phenol red solution and the enzymatic suspension being tested was incubated at 37°C for 30 min. Similarly, culture extracts were analyzed in aliquot containing ceftriaxone and tazobactam (4 mg/ml). A test result was considered positive when the aliquot containing cefotaxime alone turned from red to yellow/orange and the aliquot containing ceftriaxone supplemented with tazobactam remained red (unchanged color). Simultaneously, these isolates have also been tested for ESBL by DDST method, following CLSI recommendations, using cefotaxime, ceftazidime, or cefepime and a second disc containing clavulanic acid. The ESBL NDP test was also used directly with blood cultures inoculated with ESBL producers (n = 80) and non-ESBL producers (n = 128). Descriptive statistics such as mean and ratio are used for the interpretation of the study. 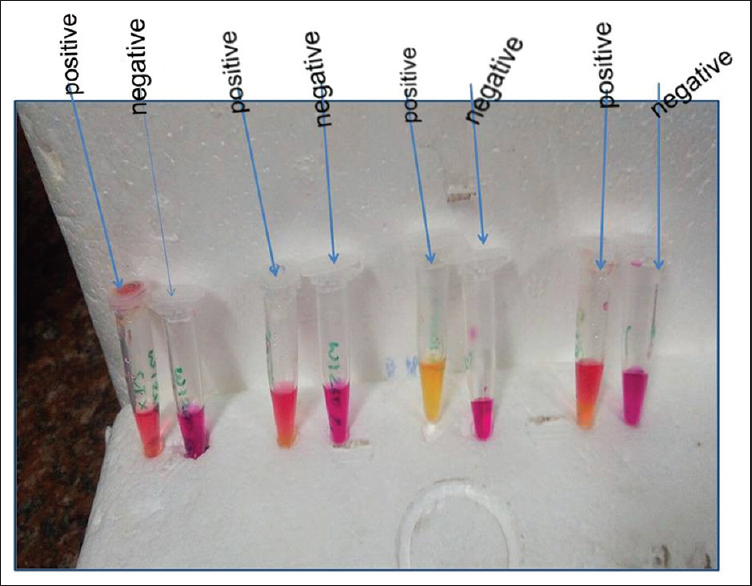 Using the ESBL NDP test, from the 208 isolates, 80 of 208 (40%) of the tested isolates produced ESBLs as the color of the aliquot turned from red to yellow in the presence of cefotaxime and remained red when tazobactam was added [Figure 1], among which Escherichia More Details coli were 56 (70%) and Klebsiella pneumonia were 24 (30%) which showed positive result. Our results show a perfect correlation between the ESBL NDP test and DDST in detecting ESBLs [Table 1]. A 100% correlation between intermediate susceptibility to cefotaxime and positivity of the ESBL NDP test was observed, whereas this correlation was 76.6% and 74.4%, respectively, when ceftazidime and cefepime susceptibility results were used for this same comparison. This study thus signifies that, among the cephalosporins, resistance to cefotaxime is a better marker of ESBL production than ceftazidime and cefepime. The ESBL NDP test was used directly with blood cultures inoculated with ESBL producers (n = 80) and non-ESBL producers (n = 128). The results showed sensitivity of 100%, a specificity of 100%, a positive predictive value of 100%, and a negative predictive value of 100% for the detection of ESBL in comparison to DDST test as recommended by CLSI for ESBL detection. The total amount of time required to obtain results using spiked blood cultures was <2 h.
Detection of ESBLs that are the main source of cephalosporin resistance in Enterobacteriaceae still depends on antibiotic susceptibility testing, results of which usually take 24–48 h. We showed that the ESBL NDP test directly performed from colony itself is a reliable technique to identify ESBL within 30 min. A correlation between DDST positivity and positivity by the ESBL NDP test has been observed. This inexpensive ESBL NDP test might be implemented worldwide, especially in resource-limited settings of developing countries. It may optimize rapid choices of antibiotics for treating bloodstream infections and avoidance of overuse of carbapenems. Finally, a rapid detection of identification of ESBL in species likely to be the source of nosocomial outbreaks (K. pneumoniae and E. coli spp.) is necessary that will facilitate implementation of a rapid strategy for containment. ESBL-NDP test is cheap, rapid, sensitive, and specific. It easily facilitates the detection of carriage of ESBL producers. It is particularly effective for detecting the CTX-M producers that currently account for most of the ESBLs identified worldwide. In the present study, out of 208, 80 of the tested strains were ESBL producers. This could be attributed to the empirical usage of third-generation cephalosporins in treatment of nosocomial infections in our hospitals. The ESBL NDP test offers a simple and rapid test with an almost perfect relation with the standard DDST in detecting ESBLs which could significantly help in guiding first-line antibiotic therapy and improve the outcome of infected patients. Use of this test might significantly improve the outcome for patients infected with ESBL producers by supporting a better antimicrobial stewardship through the rapid and accurate identification of ESBL-producing isolates. Our study also shows that this assay, besides detecting ESBL producers among bacterial colonies grown on media before antimicrobial sensitivity testing, can also be easily implemented for the detection of ESBL-producing isolates from blood cultures. Of note, the overall sensitivity (100%) of the ESBL NDP test was even higher using this blood culture protocol, which could be explained by the increased inoculums recovered from blood culture experiments compared to those recovered during pure culture experiments. This inexpensive ESBL NDP test might be implemented worldwide, especially in resource-limited settings of developing countries to optimize rapid choices of antibiotics for treating severe infections and avoidance of overuse of carbapenems. Paterson DL, Bonomo RA. Extended-spectrum beta-lactamases: A clinical update. Clin Microbiol Rev 2005;18:657-86. Paterson DL, Ko WC, Von Gottberg A, Casellas JM, Mulazimoglu L, Klugman KP, et al. Outcome of cephalosporin treatment for serious infections due to apparently susceptible organisms producing extended-spectrum beta-lactamases: Implications for the clinical microbiology laboratory. J Clin Microbiol 2001;39:2206-12. Siegel JD, Rhinehart E, Jackson M, Chiarello L, Health Care Infection Control Practices Advisory Committee. 2007 guideline for isolation precautions: Preventing transmission of infectious agents in health care settings. Am J Infect Control 2007;35:S65-164. Angus DC, Linde-Zwirble WT, Lidicker J, Clermont G, Carcillo J, Pinsky MR, et al. Epidemiology of severe sepsis in the united states: Analysis of incidence, outcome, and associated costs of care. Crit Care Med 2001;29:1303-10. Bush K, Jacoby GA. Updated functional classification of beta-lactamases. Antimicrob Agents Chemother 2010;54:969-76. Poirel L, Bonnin RA, Nordmann P. Genetic support and diversity of acquired extended-spectrum β-lactamases in Gram-negative rods. Infect Genet Evol 2012;12:883-93. Cuzon G, Naas T, Bogaerts P, Glupczynski Y, Nordmann P. Evaluation of a DNA microarray for the rapid detection of extended-spectrum β-lactamases (TEM, SHV and CTX-M), plasmid-mediated cephalosporinases (CMY-2-like, DHA, FOX, ACC-1, ACT/MIR and CMY-1-like/MOX) and carbapenemases (KPC, OXA-48, VIM, IMP and NDM). J Antimicrob Chemother 2012;10:17. Nordmann P, Dortet L, Poirel L. Rapid detection of extended-spectrum-β-lactamase-producing Enterobacteriaceae. J Clin Microbiol 2012;50:3016-22. Clinical Laboratory Standards Institute. Performance Standards for Antimicrobial Susceptibility Testing: Twenty Fourth Informational Supplement M100-S24. Tacconelli E, Cataldo MA, Dancer SJ, De Angelis G, Falcone M, Frank U, et al. ESCMID guidelines for the management of the infection control measures to reduce transmission of multidrug-resistant Gram-negative bacteria in hospitalized patients. Clin Microbiol Infect 2014;20 Suppl 1:1-55. Schwaber MJ, Navon-Venezia S, Kaye KS, Ben-Ami R, Schwartz D, Carmeli Y, et al. Clinical and economic impact of bacteremia with extended- spectrum-beta-lactamase-producing Enterobacteriaceae. Antimicrob Agents Chemother 2006;50:1257-62.